Material shall be a fresh ready-mix plant concrete mix, with “one-two” blend portland cement (uncolored) at minimum compressive strength of 3,500 P.S.I., unless otherwise stated in contract. 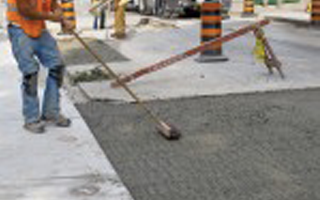 All sub-grade upon which concrete is to be placed shall be thoroughly compacted and moistened. Sub-grade shall be compacted to ninety-five percent (95%) proctor. Forms shall conform to shape, links and dimensions of the concrete. Unexposed surfaces shall have forms of #2 common (or better) lumber. Exposed surfaces, inside of concrete vaults, shall have plywood forms or form lining. There will be no bleed water present on surface of concrete when finishing occurs. No brooming will be done until cement has finished bleeding.